If you haven’t been to Osheaga before, your ignorance should not be considered bliss. 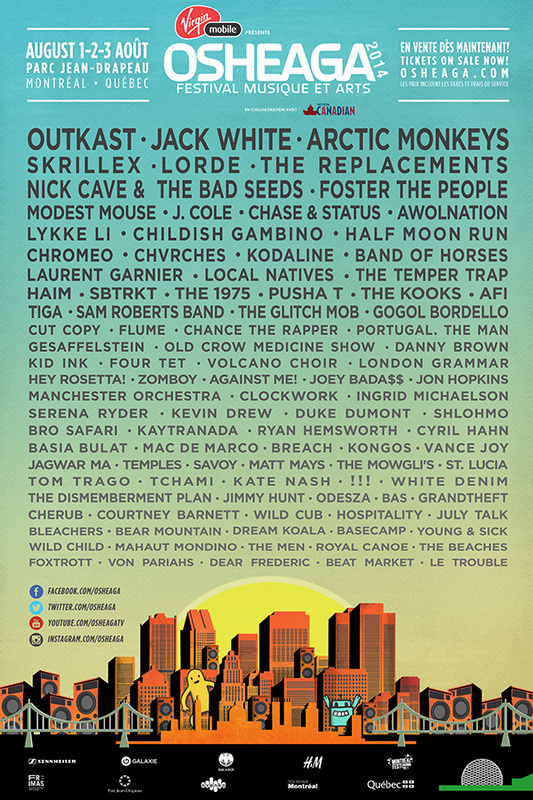 With incredible performances in the 2013 edition from Mumford and Sons, Kendrick Lamar (the newest member of the ‘should have won a grammy’ club), and the ultra buzz worthy Wild Belle, Osheaga 2013 was an event that truly solidified the festival as one of the best that Canada has to offer. The 2014 edition is primed to ramp things up with massive headliners such as Outkast who have included the Montreal festival as one of their many stops on their reunion tour, the legendary Jack White, and one of Britain’s finest bands, the Arctic Monkeys. As much as the incredible acts make an impact on the festival, it is the atmosphere and buzz that surrounds the city during the festival that I’m most looking forward to. For a more in depth look at the festival, check out our coverage from last year, written by Lucas Mariano, and take a peak at what the festival has to offer in 2014 below.